Summer means it's time for parties, pools, grilling, capes, ghosts, and cybernetic tanks . . . regular summer stuff. Start off the hottest months of the year with these even hotter new releases! Fly through the city. Smash the villains. 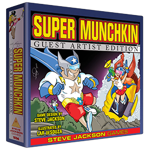 This Guest Artist Edition joins the unique visual style of comic creator Lar deSouza with Super Munchkin - a parody of capes, utility belts, day-saving, and nemeses. DeSouza's stylized comic art perfectly suits the game's pulpy sense of fun. Be a Mutant, an Exotic, a Mystic, or a Techno. Get bonuses from a Plot Device, the Telezapinator, some Heroic Angst, or the (jet-powered) Pogo Stick. The higher your Level, the more Powers you can have. Battle dastardly masterminds, devastating monsters, and invading aliens from the next dimension - from the wimpy Bucketman all the way up to the Big Ol' Planet Eater Guy himself. It's Halloween – and you're a ghost who loves candy! Haunt trick-or-treaters so they'll leave you their sugary treats - collect more than your spectral opponents, and you win! But don't scare the costumed kids too much, or they'll run away - and that means less candy for you! Pay special attention to the kids' unique powers, too; each one is themed to their Halloween costume. May the savviest spook win! 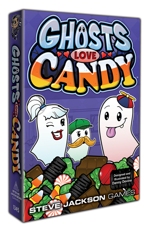 The ghost, kid, and candy cards feature frighteningly adorable art. This is the cutest game you've ever played about a haunting! It's scary, fast-playing fun for three to six phantoms. An Ogre questions its luck as it returns home in "Gauntlet." "Longview" features a Command Post that can fight back. And in "Sidewinder," the map is turned on its side, changing the dynamics of the terrain for both the Ogre and the defenders. These and six other scenarios are curated for your enjoyment! 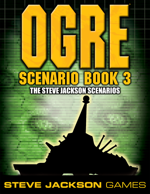 Ogre Scenario Book 1 - A classic, now updated for Ogre Sixth Edition. Ogre Scenario Book 2 - The winners of our scenario contest from the Ogre Designer's Edition Kickstarter. Trek across thousands of miles of adventure. For centuries, East met West along the Silk Road. 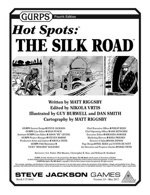 With GURPS Hot Spots: The Silk Road, this time and place comes alive for your campaigns, with details about the region's people, food, religions, languages, and architecture. Travel with rare goods through bandit country, navigate micro-wars for dominance, or quest for holy lore and artifacts. Use The Silk Road and its included maps in your historical campaigns . . . or blend it with other GURPS genres, from Dungeon Fantasy to Horror and beyond! Not all challenges can be solved with a sword or blaster. To rise above adversity, you must first understand the problems you face. 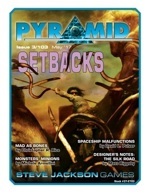 This issue of Pyramid, the PDF magazine for roleplayers, presents a variety of setbacks and obstacles for adventurers to overcome. David L. Pulver offers a system for GURPS Spaceships malfunctions to endure and fix. Matt Riggsby gives designer's notes for GURPS Hot Spots: The Silk Road that includes a handful of new mythic monsters perfect for that historical setting. With this issue, it's the right time for things to go wrong! 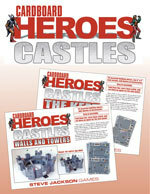 Cardboard Heroes Castles are great-looking 3-D structures that are easy to set up for play . . . and designed to fold down again for travel or storage!